Want to join Indian Army as an officer and looking for TGC 118 notification? Technical Graduation Course (TGC) 118 will commence in January 2014. Read on to know about eligibility criteria, engineering branches eligible to apply for TGC 118 course. Also complete guidance is given on how to fill up online TGC 118 application and last date to apply. Technical Graduate Course (TGC) is one of the technical officer courses of Indian Army. 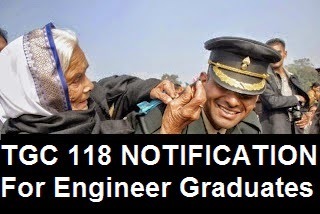 As announced earlier that TGC 118 notification will be released on 27th April, Indian Army has released official TGC 118 course notification and Army Education Corps (AEC) course notification today. Indian Army has laid down various conditions of eligibility. Thus, check out eligibility criteria of TGC 118 course here. Who can apply for TGC 118 course? All candidates who have successfully passed engineering graduation course from recognized university by Indian Government can apply for TGC 118 course. Also final year engineering students who will get all certificates by December 2013 are eligible to apply. Applicants must be Indian citizens. All central or state government employees who are serving as temporary or permanent tenure may also apply for the Techincal Graduate Course 118. Also all serving personnel of Indian Army, Navy and Air Force may apply. Territorial Army officers are also eligible to apply for this course. In order to apply for TGC 118 course, applicant should have completed or studying in engineering final year. Almost all branches of engineering graduation are eligible for applying. Important point to note is all candidates should be able to submit their final engineering certificate to Indian Army at the time of TGC 118 course commencement date. Candidates who fail to submit their graduation certificate by the course commencement date, they will be given additional twelve weeks to submit original engineering graduation certificate. Candidates who fail to submit their academic certificates in time shall be eliminated from the training and refund of training expenses will be collected from those candidates. All candidates who are of 20 to 27 years of age as on 01 January 2014 are eligible to apply for TGC course. That is, applicants must be born between 02nd January 1987 and 01st January 1994. So if you are an engineer graduate and born between given dates by Indian Army, you can apply for TGC 118 course. First of all candidates need to apply for TGC course. After receiving applications Indian Army officials will fix cut off percentage. So all candidates whose academic percentage is more than the laid down cut off of TGC will get SSB interview call letter. Shortlisted candidates then need to attend five day SSB interviews. Services Selection Board officers will then recommend candidates who have officers like qualities in them. Recommended candidates for TGC 118 course will undergo training at Indian Military Academy (IMA). Training will be provided by Indian Army for free of cost. Total TGC 118 course training period is of one year. Indian Army offers handsome salary, allowances and exciting benefits to all TGC officers.